Even with space carved out for a suitable gym on the sundeck, there is plenty of room for cocktails or large dinner parties aft. 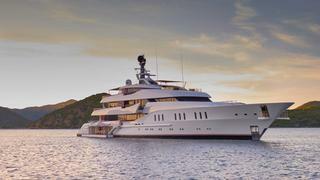 All images courtesy of Feadship. 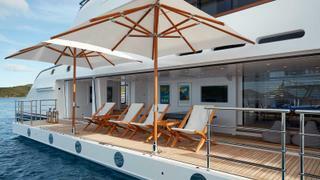 Details gain importance when an owner plans to spend long periods of time aboard a yacht. The simplicity of folding canvas deckchairs contrasts with the substantial stainless steel grilles and railings. It’s all about a connection to the outdoors. The precedent-setting floating three-deck staircase was built by Royal Van Lent to fit the substantial cut-outs on the starboard side of each deck. The US-based owners had been thrilled with their new build experience and Royal Van Lent director Arthur van Berge Henegouwen was hopeful that after their first cruise he could show the boat to select clients and perhaps some media. A lucky few were able to see the 66.25 metre Feadship at the Fort Lauderdale International Boat Show last November, and the hectic schedule explains why it’s only now that we are finally able to share the story of Vanish, the first Feadship delivered in 2016. It was worth the wait. The yacht owes both her chic interior and her innovative profile to Harrison Eidsgaard, while the customary hull lines and engineering come from De Voogt Naval Architects. The engineering solutions Feadship found to accommodate the designers’ challenges are in large part what makes Vanish a floating home the owners and their family don’t want to leave. It starts with a relationship to water. “When yachts get beyond 50 metres, [their passengers] often begin to lose their connection with the water,” says van Berge Henegouwen. “These experienced owners very much enjoy a connection to the sea.” They had cruised extensively, for the last eight years on board a 50 metre Westport, enjoying its many outdoor living and dining spaces and full beam bathing platform. The search for something bigger would have to include even better water and outdoor access. One key request was that the design avoided giving guests the feeling of being intimidated by the hull’s bulk when arriving by tender or swimming around the boat. Designers Peder Eidsgaard and Ben Harrison approached the issue of scale by seizing a generous amount of space to transition from the main deck to the bathing platform. Two sets of curved steps, flanking a cosy aft main deck seating area, sweep down to an interim landing level with cushioned sunpads before wide steps continue down to the bathing platform. That same landing level offers steps forward and down into the beach club with access to a sauna, hairdressing salon and massage area before entering the tender garage. 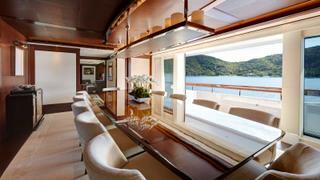 The openness is welcoming and reassuring – no surprise it’s the owners’ favourite area on board. Speaking of openness, the shell door that opens out to create a 33 square metre terrace on Vanish’s port side, is 12 metres long and 2.75 metres high – and it is nearly matched by a tender door on the port side. The hull doors fasten with huge stainless steel locking pins and pneumatic seals. The starboard door in particular is something of a marvel, sealing two watertight compartments. The yacht has a lot of volume ­– more than 1,400 GT – for her length. “When you think about it, Joy was four metres longer but 400 gross tonnes less,” says van Berge Henegouwen. It’s not about more spaces but bigger spaces. Eidsgaard discusses the yacht’s profile with passion. “She’s tall and the whole thing – all the exterior lines – result from us wanting to make her not seem too high. The sundeck roof angles down to eliminate a second forward window band. There are very, very sharp creases in her hull to create detail in an otherwise white boat and the red boot stripe and the junction lines carry the profile for 40 to 60 metres of her length, drawing the horizontal lines out.” Extra horizontal influence appears in the large stainless railings and grillwork on the sides of the superstructure. Even the unique mast does its part to tease away some of the height. The tall centre section that supports the bulk of the electronics is painted dark blue, while sharply angled side beams in contrasting white grab the attention and again pull the eye downwards. While the appearance of height was minimised on the outside, they gave it a starring role in the interior. To preserve square footage for both a formal dining room and a spectacular three-storey atrium lobby on the main deck, the designers cleverly took advantage of the yacht’s ample beam and turned the dining room sideways, thus eliminating the hallway effect that athwartships dining rooms typically present. The dining room and its massive table for 14 is to port, flanked by floor-to-ceiling windows. The overheads are Foglizzo leather panels. Above the table is an unusual chandelier: suspended from the elaborate ceiling is a large tray holding what appears to be a random assortment of candles. The artisans at Feadship created the “candles” out of alabaster and then lined them with vellum to get the right warm glow. The individual LED lights inside each one are positioned at different heights to simulate actual candles that burn at different rates. A pair of walnut pocket doors inlaid with an art deco design can isolate the room entirely but, when open, an extraordinary view spills out across a gleaming, translucent Crema Marfil marble floor and through glass balustrades to the towering starboard side windows beyond. Towering is just the word for an atrium that rises to more than 8.5 metres. 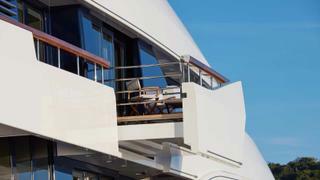 From the outside, the structure looks like any other yacht with two decks above the main. But there’s a stunning surprise inside, cutting through the ’tween deck space and notching into the superstructure to allow a marble staircase to float against a backdrop of glass. 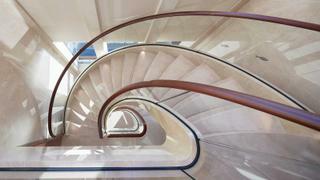 The stairway’s curved and backlit treads are Crema Marfil marble as well, as is the atrium bulkhead, its surface broken by insets of little silver fish. “And that marble lobby is right over the engine room so we had to figure out how to isolate the sound and vibration more carefully than ever,” van Berge Henegouwen says. Climbing the stairs leads to the owner’s suite. “The owner’s stateroom on his previous boat was on the bridge deck and it was something that he very much wanted to replicate,” Harrison says, “even though it limits access to the bridge for guests, because the owner’s full beam suite separates it from the main staircase.” While guests can reach the bridge via exterior stairs from the main deck, the owner has a secret door providing bridge access from the suite’s sitting room. Depending on preference, a sliding wall can separate the sitting room from the offset cabin for privacy. A separate saloon, a cosier version of the main saloon below, is aft of a pantry that these self-sufficient owners like to use for their own snacks. A grey carved silk carpet by Tai Ping updates a traditional damask pattern to offset the smooth chenille chairs, a less formal alternative to velvet – Tasior-Eidsgaard calls the effect “classic with a twist”. This saloon in turn leads to a covered al fresco lounge with chunky outdoor furniture by Glyn Peter Machin. Here and on the al fresco dining area on the deck above, small candlestick lamps by Cantalupi shed soft light via painted shades, adding warmth and a residential ambience to the outdoor spaces. 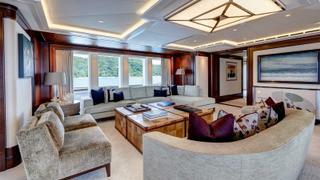 The master suite’s showstopper, however, is a private balcony that slides out from the bulwarks on the port side. Rather than requiring crew to operate and install railings, it is completely self-service. Open a glass door, push one button and the side of the superstructure slides out, complete with attached safety railings. When fully extended, the teak balcony floor rises up to be flush with the cabin floor. Vanish has the luxury of space to allow six cabins on the main deck, or five if the forward pair are configured into a full beam VIP. The same two wood species, dark brown stained walnut and oak washed with a light grey tint, are used for joinery throughout the yacht. “Formal” spaces are distinguished by slim bands of polished stainless steel inlay that mark recessed panels. 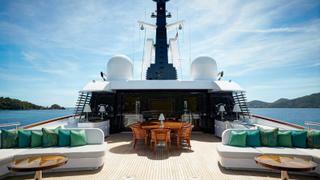 To this end, the owners asked to add a second helipad aft of the sundeck’s dining area. “The foredeck landing area is typically used for daily operations and the helicopter can even remain there when the yacht shifts anchorages. The aft location is where they would snug up the helicopter for passages or longer trips,” van Berge Henegouwen explains. And so this yacht’s vanishing act seems certain to continue. First published in the May 2018 edition of Boat International.